Mayor David G. Tate & The Hollister Park Board requests the pleasure of your company at the dedication of the stage and canopy in the Chad A. Fuqua Memorial Park. Six o’clock, Monday evening, May 2nd, 2011. 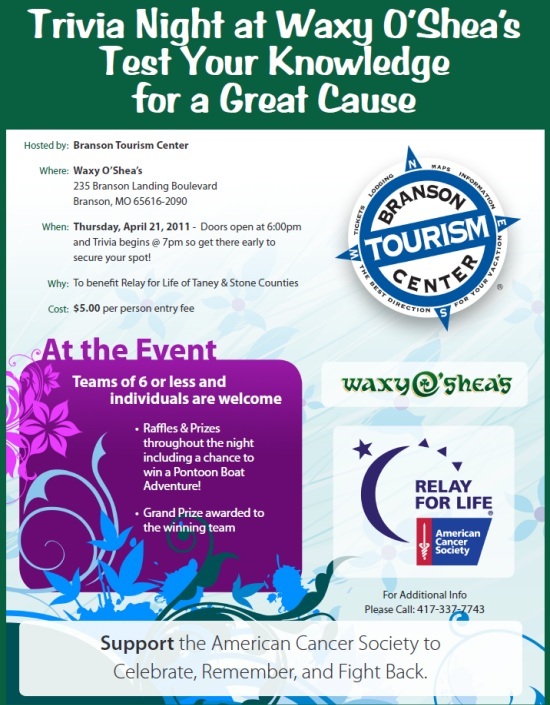 BRANSON, MO, April 1, 2011 – The owners of Branson Landing announce that menswear retailer, Jos. A. Bank and international candy sensation, IT’SUGAR, will be joining the center in 2011. Jos. A. Bank will occupy 4,000 square-feet in the former Disney Store location and IT’SUGAR will occupy 1,890 square-feet in the Wharf District. This announcement comes on the heels of the recent spring openings of Majestic Gems, Girlie Girl Originals and Pepper Palace at Branson Landing. Jos. A. Bank, a Hampstead, Maryland based retailer, who for 106 years has attracted customers to their stores by providing a heritage of quality and workmanship, an extensive selection of beautifully made, classically styled tailored and casual clothing, with prices typically 20 to 30 percent below their competitors. At Jos. A. Bank, you’ll find men’s business dress and business casual apparel, including suits, dress shirts, sport coats, pants, ties, golf sportswear and more, as well as their expert staff and sales professionals who pride themselves on service and customer satisfaction. A Boca Raton, Florida chain – IT’SUGAR has other retail locations in tourist destinations, known for taking candy and turning it into an experience. IT’SUGAR is where you’ll find a candy and gift shop filled with novelty items like the World’s Largest Gummy Bear, World’s Largest Box of Nerds, World’s Largest Reese’s Cup, exclusive WONKA items, Nostalgic Candy from the 50’s, 60’s, 70’s and 80’s, apparel, accessories and much more. Sweet and sour, rich and creamy – that’s how life should be, and that’s how it is at IT’SUGAR. Majestic Gems, a family owned fine jewelry store providing quality products and competitive prices for every budget. Girlie Girl Originals, a one-stop shop for original and unique t-shirts, coin purses, hair bows, manicure sets, writing pan and pen holders, hot iron cases, spill proof mugs and Girlie Girl Really Neat Stuff! Pepper Palace, destined to become the Midwest’s Premier Zesty Foods Headquarters with over 2,000 square feet of Tongue Tingling Delicacies. Bass Pro Shops and BELK anchor the 428,849 square-foot Branson Landing, which features well-known national retailers, including Bath & Body Works, Coldwater Creek, Chico’s and more. Branson Landing is a $435 million public/private project spanning 1.5 miles of waterfront on beautiful Lake Taneycomo, conveniently located in historic downtown Branson, Missouri. For more information, visit www.bransonlanding.com. Branson Landing is an HCW Development Company project, leased and managed by Jones Lang LaSalle. Branson, MO —The Best Western Music Capital Inn of Branson, Missouri has been recognized by TripAdvisor® as a Travelers’ Choice Family Award Hotel. The top family-friendly hotels were determined by the highest review ratings from those who traveled with family. Unlike other honors, TripAdvisor winners are based on millions of real and unbiased reviews from travelers around the world. “Receiving this award from TripAdvisor’s members is a tremendous honor,” stated Gail Myer, Vice President of Operations for Myer Hotels. “The Best Western Music Capital Inn continually strives for excellence.” Our entire team works very hard to daily exceed our guests’ expectations” noted Sue Gordy, General Manager of the Best Western Music Capital Inn. In the last few years, The Best Western Music Capital Inn has also received the Best Western Chairman’s award and was featured in NBC television’s The Great American Road Trip. This property is also consistently rated one of the top hotels in Branson according to TripAdvisor.com. Across from the Shoji Tabuchi Theater, and within walking distance to several other theaters and restaurants, the Best Western Music Capital Inn is a popular destination in Branson. (Nashville, Tennessee) – April 21, 2011 – Neal McCoy, referred to by fans & musical comrades as ‘The Entertainer’s Entertainer’, is bringing his multi-award winning, multi-platinum career to the roster of Blaster Records, as announced this week by label Chairman Tom Porter. The consummate performer boasts a career track of three platinum album certifications, beginning with his breakthrough disc “No Doubt About It” in 1994, which produced back-to back #1 singles with both the title track and Wink. McCoy has gained Entertainer of the Year honors twice on his way to winning numerous industry and fan voted awards. His endearing style and charismatic music helped the Texas native to earn multiple Top 10 singles along with gold certification on the Billboard charts. One of the industry’s most active touring artists, McCoy is credited with amassing a major fan following and brand loyalty in his 21 year career in the industry—a fact attributed to his consistent dedication to showmanship and producing innovative new music. Anticipation has already started to build for his eleventh studio project– under the new alliance with Blaster – slated for a January 2012 street date. McCoy’s latest endeavor in the field of entertainment introduced his talents as an author with the release of his first book, A NEW MOUNTAIN TO CLIMB: Heroes I’ve Met And The Mountains They Climb Every Day. In signing to the growing Blaster roster, McCoy joins break-out brother duo Brother Trouble as a major immediate concentration in the label’s focus in the field of country music. When Buck Trent says, “Oh Yeah”, and gives his famous thumbs up signal, you know you’re in for another world-class performance. 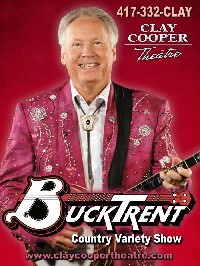 As a two-time CMA Instrumentalist of the Year, Mr. Buck is much more than a world renown 5 string banjo picker! His performance is exhilarating, fast-paced, family-friendly, and fun as he incorporates hilarious country humor, singin’, banjo-pickin’, and a variety of country music including bluegrass, southern gospel, and the good ol’ classics sung by featured vocalist Kenny Parrott. Joining Buck this year will be Terri Williams, who has an impressive career as a vocalist and entertainer doing songs by Minnie Pearl, Patsy Cline, and Dolly Parton, to name a few. Dean Holman who will also join the team this year showing off his multi-talented abilities on such instruments as the dobro, steel guitar, and banjo. Come join us at the Clay Cooper Theatre and start off your day with Mr. Banjo, Buck Trent! Andy Williams Moon River Grill NOW open for Lunch! Beginning May 2nd Moon River Grill opens for lunch! Spring-Summer hours 11am to 11pm. Come check out our NEW menu items! Don’t forget the grill’s new happy hour specials nightly! Andy Williams Moon River Grill features Andy’s mom’s recipes and all items are completely made from scratch! Hollister, MO – Don’t miss the 26th Annual Hollister Easter Egg Hunt this Saturday, April 23rd from 12:30—2:00pm at the Hollister High School Football Field. This is another fantastic FREE community event put on by the Hollister Area Chamber of Commerce. Last year almost 2000 people came out to enjoy this Hollister tradition—the 2nd longest running after Hollister 4th of July Fireworks! Children’s activities and games including giant inflatables, clowns, face-painting and more! …plus a visit from the Easter Bunny—all part of the festivities this Saturday. Kids will be divided into age groups (3 & under, 4–5yr, 6–7yr, and 8 & up) as they run around the field collecting the 5,000 candy-filled eggs! All children are encouraged to bring their own Easter basket or bag for collecting—as supplies will be limited. While the event kicks off at 12:30 – the “Hunt” begins promptly at 1:00pm – so don’t be late! This event would not be possible without the support of our local businesses and Hollister Chamber Members. A special Thank You to our 2011 Sponsors: St. John’s Clinic of Hollister, CenturyLink, The Keeter Center, KOMC/KRZK Hometown Radio, Parade of Homes Magazine, McDonald’s, Perfect Signs and The Spirits Shop. Sponsorship opportunities still available. Call 334-3050 for details. Jim is filming his Thursday 3:00 pm show to be used for television and he needs you to be in the audience! So call you aunt, uncle, grandma, grandpa, third cousin, neighbor, or whatever and come for a great show filled with fun and laughter! Tickets are only $10.00 per person. 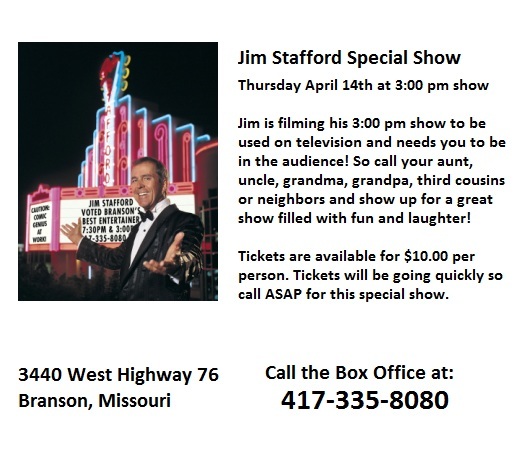 Make your reservations today by calling the Jim Stafford Theatre at 417-335-8080. 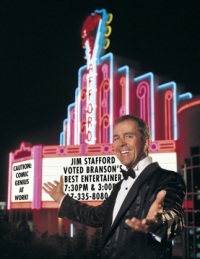 The theatre is located at 3440 West Highway 76, Branson, Missouri.